All three black boxes of the crashed Ilyushin Il-76 have been recovered, according to statement of Russian consul-general quoted by Express News channel in its December 14, 2010 report. Aboard the ill-fated aircraft there was only one Russian national who was an aircraft cargo engineer, other crew members of the aircraft were non-Russian. Registration of crashed Ilyushin Il-76 is confirmed as 4L-GNI and it was carrying humanitarian cargo. Click here to see large photo. KARACHI (December 15, 2010) : The cargo aircraft crashed on November 28 near Jinnah International Airport was not Russian. The Russian Consul General in Karachi Andrey Demidov on Tuesday while briefing a group of journalists said that a cargo plane Ilyushin Il-76TD, belonged to the Georgian private air company "Sun Way", crashed into residential area two minutes after takeoff from the Jinnah International Airport, Karachi on November 28, 2010. He said that the plane, board number 4L-GNI, was manufactured in 1984 in Uzbekistan, Union of Soviet Socialist Republics (USSR). Since 1991 this aircraft was assigned to Tbilisi airport (Georgia). The flight number MGC-4412 was bound to Khartoum, Sudan, and carried humanitarian cargo. The Consul General said there were eight members of the crew on the board, including seven Ukrainians and one Russian citizen. Russian national, Aleksander Ulyanov, held position as a cargo engineer of the aircraft. All the crew members died. The plane crashed into a housing scheme near PNS Bahadur, in the Dalmia neighbourhood of Karachi. He said that the Pakistani rescue services have collected the eight charred bodies and all the three black boxes. For identification of the bodies a DNA test is needed. As to Russian national, his relatives have already prepared their blood samples, which will be delivered to Karachi soon. The Consulate General of Russia is in regular contact with Pakistani officials. He said that an investigation team from the Interstate Aviation Committee has come to Karachi on December 06, 2010. This team includes members from the Industrial Enterprise "Saturn" - www.npo-saturn.ru - (engine manufacturer) and Ilyushin Aviation Complex (www.ilyushin.org). The investigators have equipment and experience to do their work properly. The Interstate Aviation Committee (IAC) is the independent international organisation which was formed on the basis of the intergovernmental Agreement on Civil Aviation and Air Space Use (the Agreement), signed on 30.12.9 1. By present time the participants of the Agreement are Azerbaijan, Armenia, Belarus, Georgia, Kazakhstan, Kyrgyzstan, Moldova, Russia, Tajikistan, Turkmenistan, Uzbekistan and Ukraine. Good afternoon Abbas Ali. Sorry for my bad English. I am a relative of one of the dead crew members of IL-76. Can you explain why we do not give the dead airmen? Why do such difficulties? You can help us? nick1nick, firstly please my accept heartfelt condolences over the loss of crew members including your relative in this sad accident. As far as handing over remains of crew members is concerned, I believe the authorities will conduct DNA tests before handing over bodies of dead crew members to their relatives. Have you or other relatives of dead crew contacted by anyone for DNA tests ? Probably DNA test kits will be sent to crew members relatives in Ukraine for DNA matching process. And after completion of DNA matching process the bodies will be sent to relatives. If you and relatives of other crew members are facing difficulty in getting bodies of crew members then do post details of difficulty faced by you here. You can explain details of the difficulty faced by you here. You may also contact Pakistan Embassy in your country in this regard. Also try to contact Pakistan Air Line Pilots Association (PALPA) and they might also be able to assist relatives of Il-76 crew members in getting bodies. Relatives of the dead pilots have sent blood samples from 12.06.2010 to DNA in Pakistan. Blood is in Karachi. Analysis of DNA do not. We are told that the Pakistani authorities to the difficulties with the reagents for analysis. ^ Okay I understand, it can take two to three weeks because DNA matching facility is available only in Pakistani city of Islamabad at Pakistan Institute of Medical Sciences (PIMS) as far as I know. So, samples sent from Ukraine on December 6 to Karachi must have been forwarded to Islamabad. In recent JS Air Beech 1900C (AP-BJD) aircraft crash which happened in November 2010 in Karachi, nearly two to three weeks time was taken for the release of DNA matching process results to identify some of the people who died in that accident. The DNA matching process for JS Air crash victims was done in city of Islamabad. I'm sure you'll get reply about Il-76 crew members DNA results in next few days. You can post details here if you don't get any reply in coming days. Please accept my condolences for your loss. Further to what Abbas said, have you been in touch with your Embassy in Pakistan. May be they can intervene and expedite the process. ÃƒÂÃ…Â¸Ãƒâ€˜Ã¢â€šÂ¬ÃƒÂÃ‚Â¸ÃƒÂÃ‚Â¹ÃƒÂÃ‚Â¼Ãƒâ€˜Ã¢â‚¬â€œÃƒâ€˜Ã¢â‚¬Å¡Ãƒâ€˜Ã…â€™ ÃƒÂÃ‚Â¼ÃƒÂÃ‚Â¾Ãƒâ€˜Ã¢â‚¬â€ Ãƒâ€˜Ã‚ÂÃƒÂÃ‚Â¿Ãƒâ€˜Ã¢â‚¬â€œÃƒÂÃ‚Â²Ãƒâ€˜Ã¢â‚¬Â¡Ãƒâ€˜Ã†â€™Ãƒâ€˜Ã¢â‚¬Å¡Ãƒâ€˜Ã¢â‚¬Å¡Ãƒâ€˜Ã‚Â Ãƒâ€˜Ã†â€™ ÃƒÂÃ‚Â²ÃƒÂÃ‚Â°Ãƒâ€˜Ã‹â€ ÃƒÂÃ‚Â¾ÃƒÂÃ‚Â¼Ãƒâ€˜Ã†â€™ ÃƒÂÃ‚Â²Ãƒâ€˜Ã¢â‚¬Å¡Ãƒâ€˜Ã¢â€šÂ¬ÃƒÂÃ‚Â°Ãƒâ€˜Ã¢â‚¬Å¡ÃƒÂÃ‚Â¸. ÃƒÂÃ¢â‚¬ÂÃƒÂÃ‚Â°ÃƒÂÃ‚Â»Ãƒâ€˜Ã¢â‚¬â€œ ÃƒÂÃ‚Â´ÃƒÂÃ‚Â¾ Ãƒâ€˜Ã¢â‚¬Å¡ÃƒÂÃ‚Â¾ÃƒÂÃ‚Â³ÃƒÂÃ‚Â¾, Ãƒâ€˜Ã¢â‚¬Â°ÃƒÂÃ‚Â¾ ÃƒÂÃ‚ÂÃƒÂÃ‚Â±ÃƒÂÃ‚Â±ÃƒÂÃ‚Â°Ãƒâ€˜Ã‚Â Ãƒâ€˜Ã‚ÂÃƒÂÃ‚ÂºÃƒÂÃ‚Â°ÃƒÂÃ‚Â·ÃƒÂÃ‚Â°ÃƒÂÃ‚Â², ÃƒÂÃ‚Â²ÃƒÂÃ‚Â¸ ÃƒÂÃ‚Â±Ãƒâ€˜Ã†â€™ÃƒÂÃ‚Â»ÃƒÂÃ‚Â¸ ÃƒÂÃ‚Â² ÃƒÂÃ‚ÂºÃƒÂÃ‚Â¾ÃƒÂÃ‚Â½Ãƒâ€˜Ã¢â‚¬Å¡ÃƒÂÃ‚Â°ÃƒÂÃ‚ÂºÃƒâ€˜Ã¢â‚¬Å¡Ãƒâ€˜Ã¢â‚¬â€œ ÃƒÂÃ‚Â· ÃƒÂÃ‚Â²ÃƒÂÃ‚Â°Ãƒâ€˜Ã‹â€ ÃƒÂÃ‚Â¸ÃƒÂÃ‚Â¼ ÃƒÂÃ‚Â¿ÃƒÂÃ‚Â¾Ãƒâ€˜Ã‚ÂÃƒÂÃ‚Â¾ÃƒÂÃ‚Â»Ãƒâ€˜Ã…â€™Ãƒâ€˜Ã‚ÂÃƒâ€˜Ã¢â‚¬Å¡ÃƒÂÃ‚Â²ÃƒÂÃ‚Â¾ÃƒÂÃ‚Â¼ Ãƒâ€˜Ã†â€™ ÃƒÂÃ…Â¸ÃƒÂÃ‚Â°ÃƒÂÃ‚ÂºÃƒÂÃ‚Â¸Ãƒâ€˜Ã‚ÂÃƒâ€˜Ã¢â‚¬Å¡ÃƒÂÃ‚Â°ÃƒÂÃ‚Â½Ãƒâ€˜Ã¢â‚¬â€œ. ÃƒÂÃ…â€œÃƒÂÃ‚Â¾ÃƒÂÃ‚Â¶ÃƒÂÃ‚Âµ ÃƒÂÃ‚Â±Ãƒâ€˜Ã†â€™Ãƒâ€˜Ã¢â‚¬Å¡ÃƒÂÃ‚Â¸, ÃƒÂÃ‚Â²ÃƒÂÃ‚Â¾ÃƒÂÃ‚Â½ÃƒÂÃ‚Â¸ ÃƒÂÃ‚Â¼ÃƒÂÃ‚Â¾ÃƒÂÃ‚Â¶Ãƒâ€˜Ã†â€™Ãƒâ€˜Ã¢â‚¬Å¡Ãƒâ€˜Ã…â€™ ÃƒÂÃ‚Â²Ãƒâ€˜Ã¢â‚¬Å¡Ãƒâ€˜Ã¢â€šÂ¬Ãƒâ€˜Ã†â€™Ãƒâ€˜Ã¢â‚¬Å¡ÃƒÂÃ‚Â¸Ãƒâ€˜Ã¢â‚¬Å¡ÃƒÂÃ‚Â¸Ãƒâ€˜Ã‚ÂÃƒâ€˜Ã‚Â Ãƒâ€˜Ã¢â‚¬â€œ expediate ÃƒÂÃ‚Â¿Ãƒâ€˜Ã¢â€šÂ¬ÃƒÂÃ‚Â¾Ãƒâ€˜Ã¢â‚¬Â ÃƒÂÃ‚ÂµÃƒâ€˜Ã‚ÂÃƒâ€˜Ã†â€™. ÃƒÂÃ…Â¸Ãƒâ€˜Ã¢â€šÂ¬ÃƒÂÃ‚Â¸ÃƒÂÃ‚Â¼ÃƒÂÃ‚Â¸Ãƒâ€˜Ã¢â‚¬Å¡ÃƒÂÃ‚Âµ ÃƒÂÃ‚Â¼ÃƒÂÃ‚Â¾ÃƒÂÃ‚Â¸ Ãƒâ€˜Ã‚ÂÃƒÂÃ‚Â¾ÃƒÂÃ‚Â±ÃƒÂÃ‚Â¾ÃƒÂÃ‚Â»ÃƒÂÃ‚ÂµÃƒÂÃ‚Â·ÃƒÂÃ‚Â½ÃƒÂÃ‚Â¾ÃƒÂÃ‚Â²ÃƒÂÃ‚Â°ÃƒÂÃ‚Â½ÃƒÂÃ‚Â¸Ãƒâ€˜Ã‚Â ÃƒÂÃ‚Â² ÃƒÂÃ‚Â²ÃƒÂÃ‚Â°Ãƒâ€˜Ã‹â€ ÃƒÂÃ‚ÂµÃƒÂÃ‚Â¼ ÃƒÂÃ‚Â¿ÃƒÂÃ‚Â¾Ãƒâ€˜Ã¢â‚¬Å¡ÃƒÂÃ‚ÂµÃƒâ€˜Ã¢â€šÂ¬ÃƒÂÃ‚Â¸. ÃƒÂÃ¢â‚¬ÂÃƒÂÃ‚Â°ÃƒÂÃ‚Â»ÃƒÂÃ‚ÂµÃƒÂÃ‚Âµ ÃƒÂÃ‚Âº Ãƒâ€˜Ã¢â‚¬Å¡ÃƒÂÃ‚Â¾ÃƒÂÃ‚Â¼Ãƒâ€˜Ã†â€™, Ãƒâ€˜Ã¢â‚¬Â¡Ãƒâ€˜Ã¢â‚¬Å¡ÃƒÂÃ‚Â¾ ÃƒÂÃ‚ÂÃƒÂÃ‚Â±ÃƒÂÃ‚Â±ÃƒÂÃ‚Â°Ãƒâ€˜Ã‚Â Ãƒâ€˜Ã‚ÂÃƒÂÃ‚ÂºÃƒÂÃ‚Â°ÃƒÂÃ‚Â·ÃƒÂÃ‚Â°ÃƒÂÃ‚Â», ÃƒÂÃ‚Â²Ãƒâ€˜Ã¢â‚¬Â¹ ÃƒÂÃ‚Â±Ãƒâ€˜Ã¢â‚¬Â¹ÃƒÂÃ‚Â»ÃƒÂÃ‚Â¸ ÃƒÂÃ‚Â² ÃƒÂÃ‚ÂºÃƒÂÃ‚Â¾ÃƒÂÃ‚Â½Ãƒâ€˜Ã¢â‚¬Å¡ÃƒÂÃ‚Â°ÃƒÂÃ‚ÂºÃƒâ€˜Ã¢â‚¬Å¡ÃƒÂÃ‚Âµ Ãƒâ€˜Ã‚Â ÃƒÂÃ‚Â²ÃƒÂÃ‚Â°Ãƒâ€˜Ã‹â€ ÃƒÂÃ‚Â¸ÃƒÂÃ‚Â¼ ÃƒÂÃ‚Â¿ÃƒÂÃ‚Â¾Ãƒâ€˜Ã‚ÂÃƒÂÃ‚Â¾ÃƒÂÃ‚Â»Ãƒâ€˜Ã…â€™Ãƒâ€˜Ã‚ÂÃƒâ€˜Ã¢â‚¬Å¡ÃƒÂÃ‚Â²ÃƒÂÃ‚Â¾ÃƒÂÃ‚Â¼ ÃƒÂÃ‚Â² ÃƒÂÃ…Â¸ÃƒÂÃ‚Â°ÃƒÂÃ‚ÂºÃƒÂÃ‚Â¸Ãƒâ€˜Ã‚ÂÃƒâ€˜Ã¢â‚¬Å¡ÃƒÂÃ‚Â°ÃƒÂÃ‚Â½ÃƒÂÃ‚Âµ. ÃƒÂÃ…â€œÃƒÂÃ‚Â¾ÃƒÂÃ‚Â¶ÃƒÂÃ‚ÂµÃƒâ€˜Ã¢â‚¬Å¡ ÃƒÂÃ‚Â±Ãƒâ€˜Ã¢â‚¬Â¹Ãƒâ€˜Ã¢â‚¬Å¡Ãƒâ€˜Ã…â€™, ÃƒÂÃ‚Â¾ÃƒÂÃ‚Â½ÃƒÂÃ‚Â¸ ÃƒÂÃ‚Â¼ÃƒÂÃ‚Â¾ÃƒÂÃ‚Â³Ãƒâ€˜Ã†â€™Ãƒâ€˜Ã¢â‚¬Å¡ ÃƒÂÃ‚Â²ÃƒÂÃ‚Â¼ÃƒÂÃ‚ÂµÃƒâ€˜Ã‹â€ ÃƒÂÃ‚Â°Ãƒâ€˜Ã¢â‚¬Å¡Ãƒâ€˜Ã…â€™Ãƒâ€˜Ã‚ÂÃƒâ€˜Ã‚Â ÃƒÂÃ‚Â¸ Ãƒâ€˜Ã†â€™Ãƒâ€˜Ã‚ÂÃƒÂÃ‚ÂºÃƒÂÃ‚Â¾Ãƒâ€˜Ã¢â€šÂ¬ÃƒÂÃ‚Â¸Ãƒâ€˜Ã¢â‚¬Å¡Ãƒâ€˜Ã…â€™ ÃƒÂÃ‚Â¿Ãƒâ€˜Ã¢â€šÂ¬ÃƒÂÃ‚Â¾Ãƒâ€˜Ã¢â‚¬Â ÃƒÂÃ‚ÂµÃƒâ€˜Ã‚ÂÃƒâ€˜Ã‚Â. Ukrainian Embassy in Pakistan said that the delay is not in Pakistan reagents for blood DNA. We have the blood on the DNA transferred to Islamabad. The embassy said forwards in Karachi. Similarly, do not say anything. Walking in circles. Nick, if crew members relatives blood samples were sent from Ukraine on December 6 to Pakistan then DNA matching results should be expected before the end of the month of December because as I said in previous post, it took about three weeks to release DNA matching process results for some of JS Air Beech 1900C aircraft accident victims. The JS Air Beech 1900C crashed in Karachi and samples for DNA matching were sent to Islamabad. I think because in Pakistan DNA matching facility is available only in Islamabad and samples of victims of various incidents are sent to Islamabad from various parts of Pakistan and probably due to backlog at lab in Islamabad there are delays in performing DNA matching and releasing of results. It must be a painful wait for the relatives of crew members but I hope you will get results before the end of December followed by hand-over of crew's bodies to their relatives. As far as I know the bodies of Il-76 crew members are kept in a Karachi hospital mortuary and their DNA samples must have been sent to Islamabad for matching process with blood samples of their relatives received from Ukraine. Thank you that you are not indifferent to this tragedy. Expectation and the lack of information is the most difficult time for bereaved families and relatives of pilots. The Georgian company Sun Way is responsible for the registration of IL-76. The Russian company has hired pilots. The owner is unknown aircraft? The investigation will be to pay the insurance for the aircraft. This is a very big money. Before the flight crew 4L-GNL talked about problems with the engine. You know the results of the preliminary investigation? Flight 4L-GNL had to perform on the program Individual Partnership Action Plan with NATO for the delivery of humanitarian cargo. in Sudan. We have no information on whose behalf the flight was carried out. Who became a partner in NATO? Nick, unfortunately air crash investigation results are not released to public in Pakistan so most likely we in Pakistan will never know what caused Ilyushin Il-76 (4L-GNI) accident. Ukrainian and Russian teams taking part in crash investigation might release some information about result of their investigation work in Ukraine or Russia. Is it possible that 4L-GNI was chartered/leased by 'Sun Way' from company named 'Sky Georgia' ? 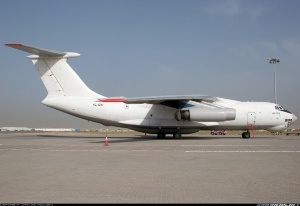 Name of 'Sky Georgia' is mentioned as operator on following photo link which shows ill-fated Ilyushin Il-76 (4L-GNI) at Sharjah Airport on April 13, 2010. Because 4L-GNI was registered in Georgia so aviation authorities in Georgia should be able to provide information which company got this aircraft registered in Georgia and which company owns this aircraft. But apparently since Sun Way was operating this flight so I think Sun Way will be responsible for paying out compensation to family members/relatives of crashed aircraft's crew members. Good afternoon Abbas Ali. Pleasantly that for thousand kilometers there are not indifferent people to our grief. Thanks you for it. You well understand aviation questions. You too the pilot? As the representative of the Ukrainian embassy has told the plane has fallen near to a residence of families of the Pakistan pilots. The crew took aside the plane from densely occupied area. To avoid a considerable quantity of victims on the earth. It so is similar to our pilots. We spoke on this theme. That there can be such situation and ÃƒÂÃ‚Â¿Ãƒâ€˜Ã¢â€šÂ¬ÃƒÂÃ‚Â¸ÃƒÂÃ‚Â¹ÃƒÂÃ‚Â´ÃƒÂÃ‚ÂµÃƒâ€˜Ã¢â‚¬Å¡Ãƒâ€˜Ã‚ÂÃƒâ€˜Ã‚Â to make such decision. Nick, I'm not a pilot but on this tragic accident I share your grief and extend my condolences to all family members of aircraft crew. The Il-76 crashed into under-construction buildings of Pakistan Navy. Unfortunately four Pakistanis on the ground also lost their lives due to this air crash. There could have been many more ground casualties had the aircraft crashed into inhabited houses/buildings. A number of people, especially ground witnesses, do believe that the pilots steered the Il-76 away from densely populated area before hitting the ground. By the way, what do pilots and members of aviation community in Ukraine believe caused this accident ? Do they think it was due to engine failure ? Although it's hard to imagine that a single engine failure on a four engine Il-76 caused this accident. Probably fuel supply line in wing caught fire due to engine explosion and fire spread rapidly and damaged aircraft control surfaces making it difficult for the pilots to control the aircraft ? In video clip showing last moments of the aircraft before it struck ground, large section of the aircraft appears to be on fire. It will be useful to know comments from Il-76 pilots from Ukraine and Russia about this accident. nick1nick wrote: Good afternoon Abbas Ali. Sorry for my bad English. I am a relative of one of the dead crew members of IL-76. Can you explain why we do not give the dead airmen? Why do such difficulties? You can help us?